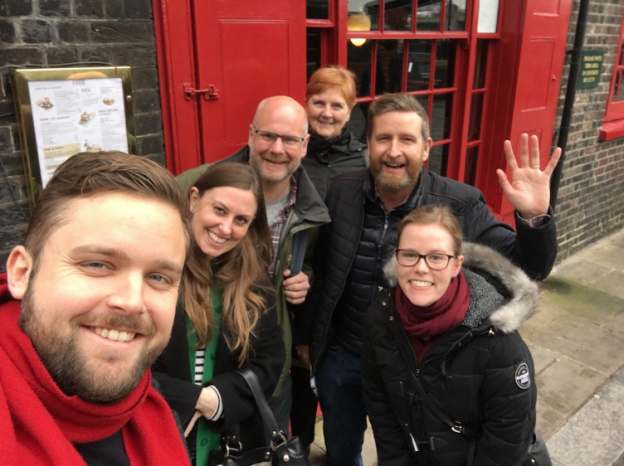 Hosting the second, ‘New Year, New You’ Street Wisdom Walk in Borough Market on Friday 12th Jan, I was joined by a fabulous group of six, who brought along a really wonderful range of questions. Two antipodean friends, working in London on short-term visas, wanted to know if London was a place to stay for a while, or if there was time to develop a long-term relationship. Someone wanted to know whether to fully commit to a charitable venture in Nepal – Girls Empowered By Travel, and another whether to ask someone out on a date. One participant had the perfect question for a New Year adventure, wanting to know what 2018 would bring…. As usual the market and its surroundings provided plenty of inspiration – whether it was drawn from the wonderful sculpture by the late Alan Collins, the plaque identifying the location of Old London Bridge, a fish and prawn wrap or the (now famous) Take Courage sign. I was particularly moved by a description of two seagulls flying over the river. One flying low and flapping frantically to stay airborne, and another effortlessly soaring high as if on an imaginary thermal. The message from this was clear – how can we be more like the soaring seagull, flying high and freely above the buffeting fluctuations of everyday life? Those looking for relationship advice and nourishment, were heartened by the abundance of many loving families and couples strolling in an around the market; and this provided inspiration for one participant to send an email asking a close friend out on a date. Here was a thought that had been brewing for some time, but it was Street Wisdom that had provided the key prompt. Could we perhaps be looking at our first Street Wisdom wedding…? A great Street Wisdom observation was provided by Sarah, one of our Australians working in London and wondering about the future. Walking past the Shard, St Pauls, Tate Modern and the Tower of London, she realised that London is an amazing place to be, for however long it lasts and living for ‘the now’ and savouring the moment, is the key to happiness.